Manila, Philippines - The complete list of winners for the the country’s most prestigious beauty pageant, Binibining Pilipinas this 2014 were announced during the grand coronation night held at the Smart Araneta Coliseum on Sunday, March 30, 2014. There are 40 contestants who showed their best with 5 crowns at stake: Miss Universe Philippines, Binibining Pilipinas-International, Binibining Pilipinas-Tourism, Binibining Pilipinas-Supranational, and Binibining Pilipinas-Intercontinental. Mary Jean Lastimosa was named Miss Universe Philippines 2014 while Mary Anne Bianca Guidotti got the Bb. Pilipinas – International 2014 title. Crowd favorite Yvethe Marie Santiago won the Bb. Pilipinas Supranational 2014. The coronation night was hosted by Kapamilya stars Anne Curtis and Xian Lim, together with Miss Universe runners-up Shamcey Supsup-Lee, Venus Raj and Janine Tugonon as presenters. 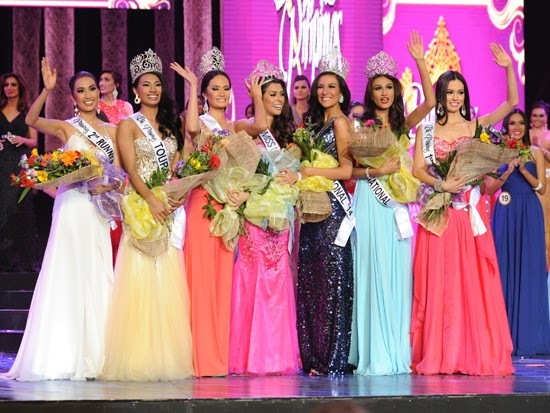 ABS-CBN aired the delayed telecast of Binibining Pilipinas on Sunday’s Best program Sunday night. Binibining Pilipinas 2014 panel of judges was led by Miss Universe 2013 Gabriela Isler. Jeron Teng, Adam Laker, Cory Vidanes, William Christopher, Gregory Domingo, Kevin Tan, Korina Sanchez, Carlo Katigbak, Julio Camarena, and Sen. Juan Edgardo Angara as members of the panel.